LOWELL -- Sean Collier's name has been synonymous with heroism. Now, the name of the late officer who lost his life in the 2013 Boston Marathon bombing will live on as part of the athletics at Lowell High School. A wrestling mat, worth $12,000, was recently donated to the high school. The red mat reads "Officer Sean A. Collier Memorial Fund." Richard Sullivan, a member of the Collier fund, said the goal is to start a wrestling program at the Stoklosa Middle School. "Originally, we were going to put it there, but then more thought got put into it and we thought it would get more use at the high school with Sean's logo on it," said Sullivan, of Dracut. He said the idea for the wrestling mat came from himself, Kyle Dolliver, a teacher at the Stoklosa Middle School, and Joe Rogers, Collier's stepfather. Collier was an MIT police officer with roots in Wilmington. He graduated from Wilmington High School in 2004 and went on to earn a bachelor's degree in criminal justice from Salem State College in 2009, according to the memorial fund's website. 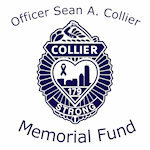 At just 26 years old, Collier was killed in the line of duty on April 15, 2013. Rogers said when he first came to New England, he settled in Lowell and has lived around the city for the past 30 years. He currently lives in Wilmington. "I felt like I know the city, I know a lot of the people. We get a lot of support for the charity out of Lowell and the surrounding towns," Rogers said. "So, I just wanted to give back. This is the type of program I think Sean would have liked." With sports programs like these, Rogers said it keeps students off the streets and gives them something productive to do. Lowell High wrestling coach George Bossi agreed. "That's why we're into sports," Bossi said. "We save kids all the time, not only just wrestling, every activity. Keep them off the streets." Bossi said the oldest wrestling mats the high school has date back to 1964. The new mat, he said, is beautiful. "It's very portable and lightweight and they're very adaptable to today's situation," Bossi said. "Big, heavy mats we had years ago are too heavy and they're very hard to transport." The ultimate goal is to have a wrestling team or club or intramural program in each of the middle schools in the city, Bossi said. "It's not something where we're just going to buy the mat and say, 'See ya later,' and just forget about what we're doing," Sullivan said. "We're trying to make the connection in Lowell with these kids and give them a reason to want to go do stuff." 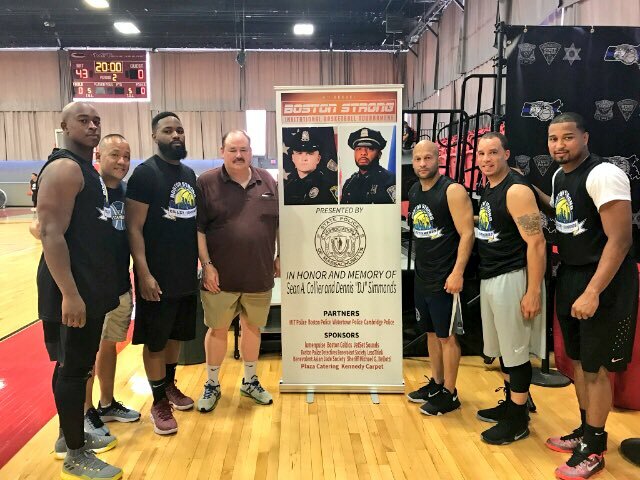 The Officer Collier Memorial Fund was one of the sponsors of the 5th Annual Boston Strong Memorial Basketball Tournament held on August 4-5, 2018. This two-day basketball tournament is a way for Boston and surrounding communities to remember and honor MIT Police Officer Sean A. Collier, Boston Police Officer Dennis J. Simmonds and all of the victims of the Boston Marathon tragedy. We were excited to again have a separate youth division in the tournament. This youth division was a huge success last year and is a positive experience for the kids. Six youth teams were co-coached by volunteer Mass State Police Troopers, Boston Police officers, and other local officers. After competition, youth teams will had lunch with their coaches where there was an open discussion. We will continue with this initiative knowing that this important connection will improve trust and understanding between our community’s youths and law enforcement officers. As part of Camp Thayer, Thayer Academy Head Varsity Basketball Coach, Brandon Odom, and his staff provide positive and informative instruction about the game of basketball. This two week basketball camp is held in honor of Coach Odom’s late brother, Steven Odom, who was shot and killed by an unknown person in a crossfire while walking home from playing basketball with neighborhood friends. Steven was 13 years old, an 8th grade student at Timilty Middle School in Boston. The basketball camp was held over two weeks in July at Thayer Academy in Braintree, MA. The camp hosted boys and girls grades 3-8. At camp, the kids participated in dynamic skill drills and stations during the morning session and listen to lectures from collegiate and professional players in the afternoon. In addition, competitive scrimmages and games round out the day and highlight what they have learned. The Memorial Fund will provide 10 total scholarships for inner city youth looking to participate in the camp but financially unable to afford to attend. 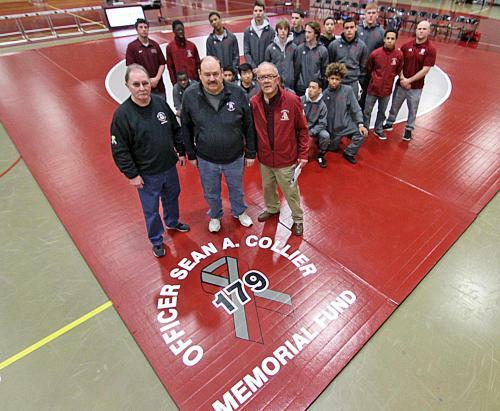 The Officer Collier Memorial Fund gave funds for scholarships to the Boston Judo Fund so that youths looking to participate in USA Judo-sanctioned events, but financially unable to afford to attend, can do so. Participation in these USA Judo events allow the participants to represent the USA at the Pan American Games, Pan American Championships, World Championships, select international competitions and the Olympic Games. Saving a Hero’s Place is a volunteer group founded by police officers in San Antonio, Texas. Officer Tommy Capell, his wife and a couple of police buddies started this charity. They build Honor Chairs for the Roll Call room commemorate officers who have died in the line of duty. This charity was started because of Sean’s death. Here is their story. Saving A Hero’s Place, Inc. was formed through tragedy. In 2013, I was contacted by another Police Officer to build a chair similar to several chairs that were placed at another sub station years back. 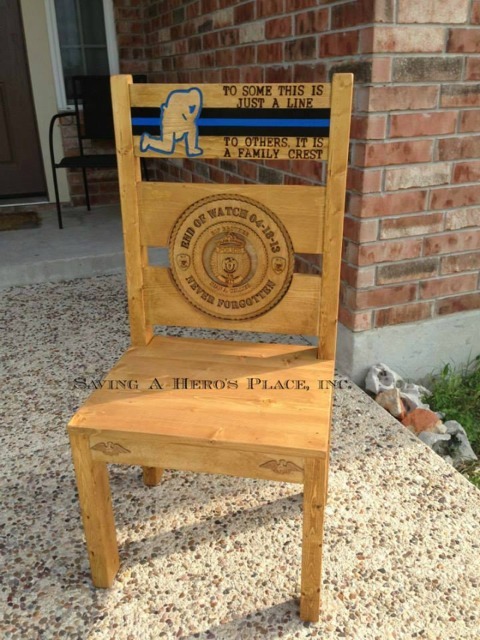 This chair would be in honor of a San Antonio Police Officer who died in the performance of his duty. The chair was built March 2013 and placed at the sub station where the officer worked. The following month, on April 18, 2013, MIT Police Officer Sean Collier was killed in the line of duty by the Boston bombers. Officer Sean Collier was sitting in his patrol vehicle serving his community. Unable to sleep for weeks, I knew something needed to be done for this officer. I immediately got with my wife Robbie Capell and two fellow classmates Brandon Bunch and Michael Pullen. It was decided that an Honor Chair was just the answer. MIT Police was contacted and welcomed the idea of an Honor Chair. After quickly raising money from the community, friends, and family, The four of us traveled by vehicle over 2,000 miles to deliver the honor chair. Officer Sean Colliers honor chair was presented on May 28, 2013. The emotions that came with this honor chair, and seeing what the chair meant to the MIT Police department, made us all realize we were not done. I have added a picture of the chair. Annual Award is given for students majoring in criminal justice.